At right - the superbly detailed Kit rendition! the placement of the seat and I started to look at pictures from books and also from other on line builds that did use the CAM Kfir set and noticed that the seat has to come half way the canopy opening. this is how far I'm talking about, It may be like you posted however to me they just seem a little to far to the back. Alos are you going to keep the side panels or are you also going to replace to too? Ps that swiss recce bird you are doing wouldn't have to ba a all black bird now would it? As to the Swiss IIIRS - probably going to do the special 'retirement' scheme - the one from the pair that had the black underside - light grey uppers and special marks - saw it at Fairford and think it looks pretty sleek! Cheers mate - email received - reply sent! hey iain, very nice work so far! a guy im "my" other forum has built both of those specially painted mirages. maybe, his thread could be interesting for your build. i think you'll have to register to see the pictures, but it's worth the "pain"! 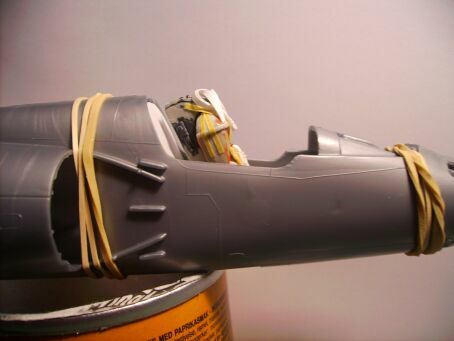 here's the link: Mirage build @ Flugzeugforum.de cant wait to see more of your work! Quite a few things I'll be doing differently - but a huge amount of useful material there! On the first page - Looks like Revell did a special boxing of the kit with the Swiss Black and White markings? The builder used masks - but did Revell do a decal sheet? I was wondering that too I never knew they made that boxing two mirages in one box way cool. I realy look foward to seeing this one getting build I realy like those schemes. I also loved his scribe- and riveting job he did on the kit it made all the difference. i think it was a special edition which was only available in switzerland. he used masks, if you want, i'll ask him where he got them. i'm quite sure that the decals where included in the kit. Matterhorn Circle has a decal sheet of same unit, earlier days:MC-One Decals. You will notice the same owl motif, smaller with added color. Ray - thanks for the Matterhorn link - may have to get a set, or two, of those Afterburner sets! Right - am off to the workbench for an hour, or so - wish me luck!